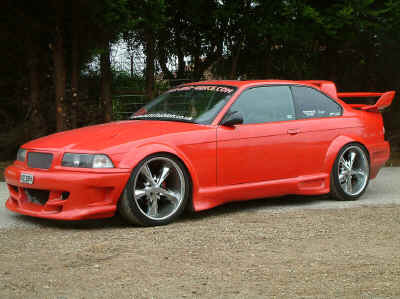 This car has already been featured in Revs, Fast Car and Performance BMW's cover. 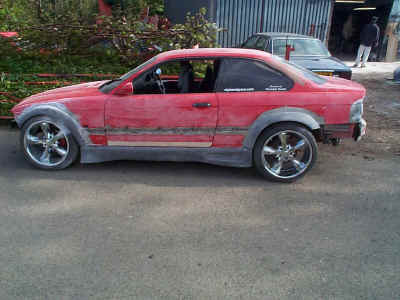 The car is now being rebuilt again and I feel sure will find its way back into the mags once completed. 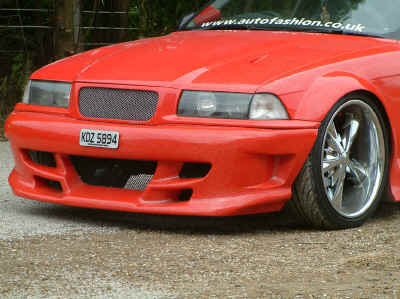 It has had our Animal front bumper for a while now, but will shortly be treated to the whole kit. To be honest the project will be a little more complicated than that. The Animal kit was designed for 18 inch wheels which were current at the time. 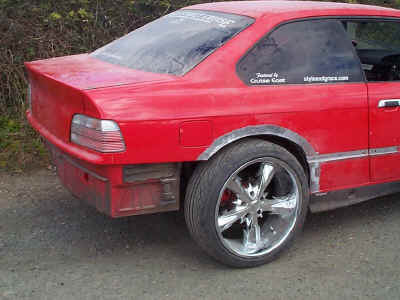 Now with every one fitting 19's and 20's to hatches 18's just seem a little small, and most of the wheel designs boring. Mik shares our view that wheels can be a little more interesting, and has imported at very great expense some awesome looking 20 inch wheels and tyres from America. These are actually quite tame compared to some of the wheels I saw when I was out there - but I love them . I believe these wheels are called "Barbs", the reason for which soon becomes clear when you wash them - the bits are razor sharp!!!. It's not easy to fit them to an E36 - we had to cut huge chunks out of the car, but at the end of the day they were on there and the car drives without catching at all!! As always the first job was to strip the car, and the second to get the wheels on, after that the styling package can be built around the wheels. 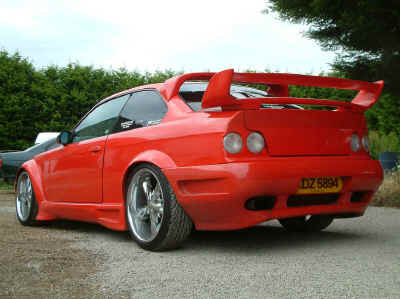 Virtually everything will have to be redesigned or changed - the arches will have to be custom built again (just like the ones we already did for Danny's E36 feature car), the skirts shortened, and both bumpers extensively modified. You can just make out the fact that the inner and outer wheelarch have been welded together to replace some of the strength taken out when the arch was cut away for the tyres to clear. 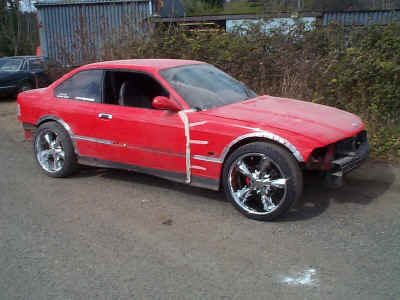 This is absolutely vital for safety, for your insurance, and MOT. 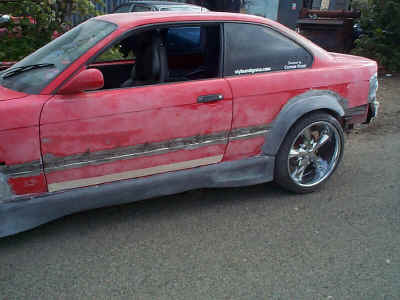 We have seen people whom don't know what they are doing just fill the gap with filler (Dantec design!) - DONT its dangerous, and illegal for road use. 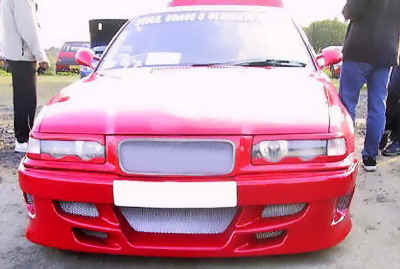 Front Arch modifications are extensive to clear tyres, and to provide fixing for the arches that are to cover the extra width. 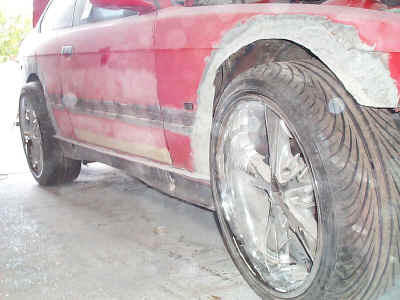 As you can see its all welded for strength. 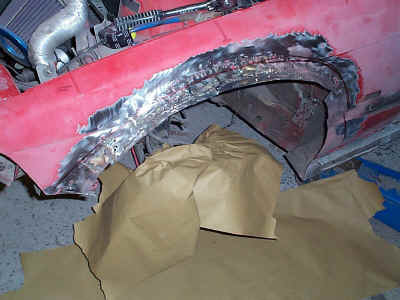 Below you can see the strip of metal that has been welded to the car to provide something for the skirts to fit onto. Note also the fact that the holes for the trim fixing clips have been welded up prior to being filled over. 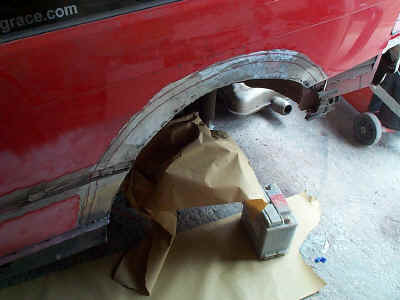 If you just fill them then the filler can sink or break off - much better to weld them especially of the doors which are slammed shut regularly. 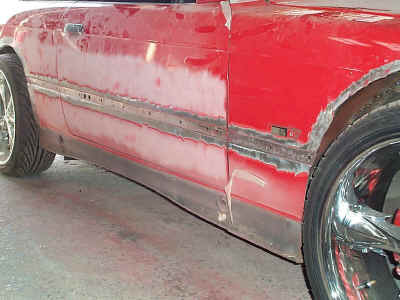 The bare metalwork is then laminated prior so being sanded, and then screwed to the car once fully cured. The arches are then bonded to this laminate. 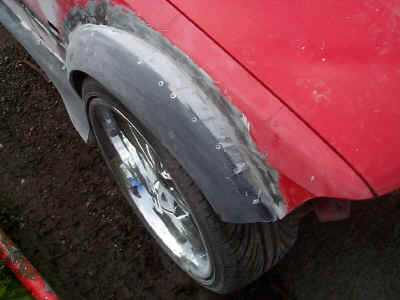 Its a long winded approach, but its this belt and braces method that ensure our bonded on parts won't crack. 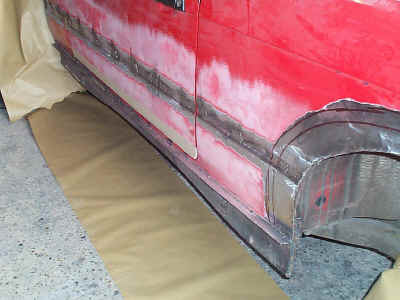 As you can see the arches and skirts have been bonded on. 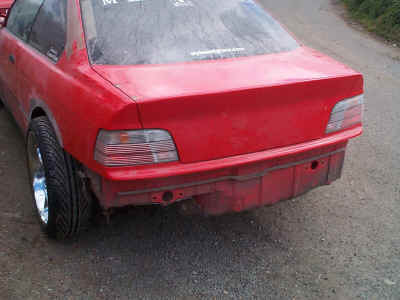 We didn't have time to take photos during the process as its a two man job and was done at Midnight, but you could check the other project cars for details of bonding/foaming skirts and arches. As always once the bonding products have gone off its a matter of removing the securing screws, sanding everything, and then starting the filler work. The complicated work has now all been done - only the custom bumpers to go. 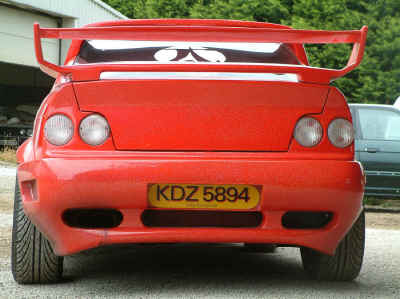 The arches are so wide the standard ones won't fit, and with the grill on the front between the arches and bumper its even more complicated than normal. 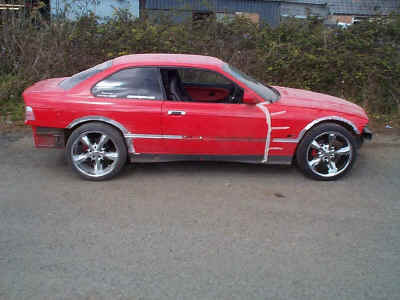 Now in metalflake rainbow paint, and with the upper screen spoiler installed the car has evolved once again. The airbags fitted to the rear of the car are an absolute godsend allowing the car to be raised at the touch of a button for extra clearance. 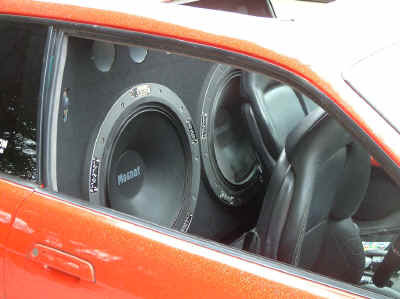 This clearance is really needed now that a pair of very heavy 20 inch subs have been fitted. This car belongs to Mik from www.style-and-grace.com where you should see more information about the car and his services or phone 07976353496.